KABUL, Afghanistan — The army will take over security in the eastern city of Jalalabad, Afghanistan officials said Tuesday, hours after attackers overran a government refugee office there, killing 15 people. It was at least the 10th such assault on civilian targets this year. 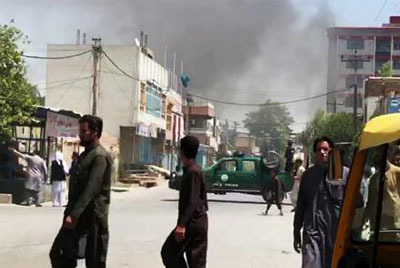 The assault was part of a series of attacks attributed to the Islamic State against “soft targets” in or near the city of Jalalabad, where the extremists have been particularly active, mostly attacking civilians rather than confronting Afghan security forces. Officials were so concerned that a decision was made to hand over security for the area to the Afghan National Army, beginning on Wednesday, according to Attaullah Khogyani, the spokesman for the governor of Nangarhar Province. The attack on Tuesday began with two midday explosions outside the Department of Refugee Affairs, with several gunmen then entering the building and its compound, Mr. Khogyani said. Special forces engaged in “intensive fighting” against the attackers, Mr. Khogyani said, and rescued several people trapped inside the building. Mr. Khogyani said the Islamic State was probably responsible for the attack, which he said had begun as refugee officials were meeting with donors’ representatives, although no foreigners were present. The 15 people killed included a woman and a police officer, Mr. Khogyani said. The International Rescue Committee, a global relief organization that has operated in Afghanistan for 30 years, said an Afghan staff member also was among those killed. “We condemn this sickening attack on a humanitarian coordination meeting, where aid workers and government officials were discussing how best to help vulnerable Afghans,” the organization said in a statement. At least 15 others were injured, some of them as a result of injuries sustained when they jumped from the building during the attack. All three attackers were killed. The Islamic State’s affiliate in Afghanistan, which calls itself the Islamic State in Khorasan, did not immediately claim responsibility, but normally it makes such claims only after an assault is over, and often the following day. The Taliban immediately denied responsibility, according to a statement from their spokesman, Zabihullah Mujahid, in line with their recent promise not to attack predominantly civilian targets.The Islamic State in Khorasan has its strongest Afghan presence in southern Nangarhar Province and has carried out at least nine other attacks against purely civilian targets in Jalalabad or nearby this year. The group turned to suicide attacks on civilian targets, particularly lightly defended ones, after being heavily battered by American airstrikes and American and Afghan special operations assaults last year.Abdul Rahman Mawen, a civil activist in Jalalabad, blamed the extremists’ declining battlefield fortunes for the attacks on soft targets. “ISIS was fighting against security forces in the first stages, but when they were beaten and suppressed by the security forces, they started attacking women, children and civilian targets,” he said. Nothing has proved off limits to the extremists. On Saturday, Islamic State fighters attacked a school for midwives in Jalalabad, killing three employees, although most of the 67 female students escaped unharmed. ISIS claimed responsibility the next day. In May, they attacked during a government and Taliban cease-fire over the Ramadan holiday of Eid al-Fitr, killing 36 civilians at a celebration in Jalalabad. On May 31, it was a boys’ school in the Khogyani district of Nangarhar Province, where the extremists beheaded three school workers. A day later, they attacked a group of minority Sikhs and Hindus waiting to meet President Ashraf Ghani while he was visiting Jalalabad; 19 were killed, including the country’s only Sikh candidate for Parliament. Among the victims of Sunday’s bombing was Avtar Singh Khalsa, the only Sikh candidate running in Afghanistan’s parliamentary elections in October. Health officials in Nangarhar confirmed that Mr. Khalsa died in the attack. His candidacy drew widespread attention across Afghanistan and was celebrated as a sign of the minority group’s resilience and dedication to the country despite the harsh times. Also among the dead was Rawail Singh, who was an active presence in civil society in Kabul. In one of the last pictures posted on his Facebook page, Mr. Singh is seen painting with his fourth-grade daughter. “My sweet daughter, learning to paint and study in the Afghan National Institute of Music,” part of the caption reads. In the earlier attack on the school in Khogyani district, the assailants beheaded three caretakers at the Malikyar Hotak boys’ high school and then set the offices and library on fire, said Mohammed Asif Shinwari, a spokesman for the Nangarhar education department. Malik Makee, a tribal elder in the district who also runs a pro-government militia, said he and his forces had arrived at the scene after residents asked for help. The three men who were killed were of “older age, like me,” he said. “We sewed their heads back on their bodies before we took them to the hospital and prepared them for funerals,” he said. Last month, the Islamic State affiliate in Afghanistan declared in a statement and in radio broadcasts that it would target schools — particularly those that teach girls — in response to the United States and Afghan military operations. Days later, three suicide bombers tried to enter the Nangarhar education department in Jalalabad, the province’s capital. Ten civilians and one police officer were wounded in that attack, officials said. “Afghan schools are increasingly at risk on military, ideological and political fault lines, with attacks increasing in eastern Afghanistan,” the Norwegian Refugee Council, which runs a program for displaced students at Malikyar Hotak school, said in a statement. Mr. Makee, the militia commander, said the school that was attacked late Saturday was in an area that is largely controlled by the Taliban. Government control in Khogyani has largely been restricted to the district center for many years, with the Taliban controlling vast parts of the area. Last year, as Islamic State fighters were squeezed in neighboring districts, they tried to overrun the Taliban in Khogyani and establish a presence there. 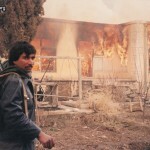 But they faced resistance both from the Taliban and the Afghan government. Some five million out of about 30 million Afghan populations have access to safe drinking water and 2.6 million have access to sanitation, according to officials.